Tripp Lite's B020-016-17 KVM Switch gives you a rack-mountable keyboard, LCD and touchpad in a single console that occupies only 1U of rack space. Easy to install and use, it's the optimal solution for controlling up to 16 computers/servers.The B020-016-17 has a built-in 17" LCD screen that supports video resolutions up to 1280 x 1024. You can switch easily between the 16 ports using on-console push buttons, an on-screen display(OSD) or keyboard hot key commands. Multi-level password security can be set up for an administrator and up to 4 local users to ensure only those with authorization can access the connected computers.This switch controls PS/2 or USB computers/servers using a P774-Series(PS/2) or P776-Series(USB) KVM Cable Kit(one of each is included). An extra HD15 port allows an additional VGA monitor to be connected. 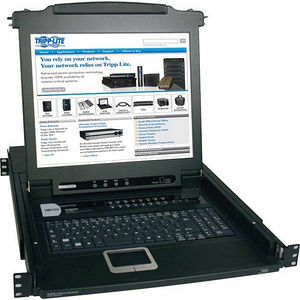 Two PS/2 ports also are included on the rear of the unit to allow for connection of a Tripp Lite B051-000 IP Remote Access Unit or an exte rnal console. When not in use, the B020-016-17 stores neatly in a rack drawer and pulls out when needed. This KVM console is compatible with all major operating systems(special keys on Mac and Sun keyboards are not supported). Heavy-duty steel housing stands up to frequent use.